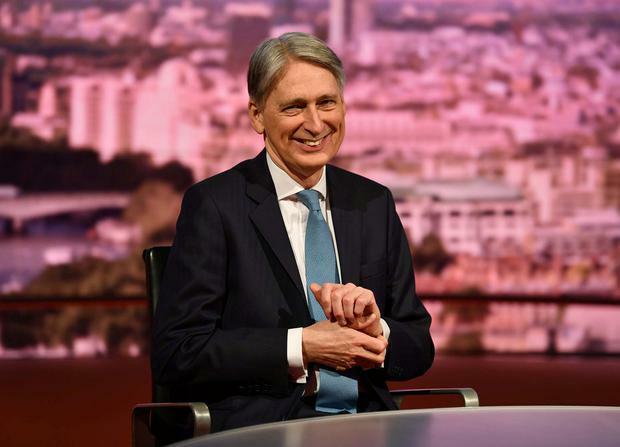 Philip Hammond has said he will review cash granted to Northern Ireland in the coming months, amid claims the UK government is trying to buy the support of DUP MPs for Theresa May's Brexit deal. The UK chancellor said that current discussions with the DUP were not about money but "political assurances", but highlighted funding for Northern Ireland would be looked at soon as part of a scheduled spending review. News that Mr Hammond is involved in the talks with the DUP, whose 10 MPs prop up the government's Commons majority, have led to speculation that a financial incentive might be involved. After the chancellor made his comments in an interview yesterday, his Labour opposite number accused him of offering a "bung" to the DUP and branded it "gutter politics". It comes as efforts continue to secure enough support in the House of Commons for the prime minister's Brexit deal in a vote currently set to take place tomorrow, though only if Mrs May believes she can win. Talks with the DUP had not concluded by yesterday evening, but there had been mounting speculation that the government would find more money for Northern Ireland as part of a deal. Speaking on BBC One's 'Andrew Marr Show', the chancellor said current discussions were not about money, but reassuring the DUP there will not be any divergence between Northern Ireland and the rest of the UK in any future relationship with the EU. But he then went on: "We are coming up to a spending review and we will have to look at all budgets including devolved block-grant budgets [money going to the four nations of the UK] in that spending review." Asked if there could be money in the review in return for voting for the deal, he added: "We haven't even started to look at it yet, but there will be a spending review. We've got an additional complexity in Northern Ireland as you know, the House of Commons voted a budget through for Northern Ireland last week. Northern Ireland is in very difficult circumstances [with parties there having so far failed to create a power-sharing executive]. "Because the civil service has not been able to take some quite difficult decisions that need taking. We hope that once we've got a Brexit deal we will be able to resume the power-sharing executive in Northern Ireland and then of course we will need to look at the spending review in that context." When the DUP agreed to prop up Mrs May's administration in the Commons after the 2017 election, the party negotiated an extra £1bn (€1.17bn) in spending for Northern Ireland over 2018 and 2019. Money in the agreement, and potentially the support of the party's 10 MPs for Mrs May, is set to end in June, creating the opportunity for its leader Arlene Foster to negotiate new terms, with the government's main ask likely to be safe passage of her Brexit deal. Up until the end of last week, talks with the DUP had been largely legal discussions with UK Attorney General Geoffrey Cox, but the involvement of Mr Hammond indicated there was a financial element to the meetings. Shadow chancellor John McDonnell hit out at Mr Hammond's comments yesterday, saying: "From his interview with Marr and his wriggling refusal on several occasions to deny the DUP is being offered a bung for voting for May's deal, it is blindingly obvious Hammond is offering a bribe to the DUP in the forthcoming spending review. Gutter politics." Mr Hammond said the vote expected tomorrow on Mrs May's deal would happen only if the prime minister thought she had enough support to pass it, echoing words from Trade Secretary Liam Fox. He said it was not now "physically possible" for the UK to leave the EU on March 29 as previously planned, because no deal has been ruled out by MPs, an approved deal is not in place and, even if MPs back one, a little more time is needed to pass necessary legislation. But in a warning to Brexiteers who are still thinking about opposing the deal tomorrow, he said: "It's absolutely vital that we get it through next week because otherwise this is the final chance to do this deal without having to have a long extension of the Article 50 period. I'm clear about that." Mr Hammond went on to dodge a question about whether he might ever say to the prime minister that it is time for her to resign. "The prime minister is absolutely focused on getting her deal through parliament. She's passionate about it because she passionately believes this deal is the best exit deal for Britain from the European Union," he said. "If she doesn't get it through then I'm sure she'll be equally committed to ensuring a process that allows parliament to find an alternative way forward."